Archives for November 11th, 2017 | Welcome To Your Pet Space! Like us, not all cats are perfect. Some of the most common disabilities both humans and cats have are deafness and blindness. But also like us, cats can live healthy and happy lives with these conditions. They may need some help along the way, but with patience, training, and letting go of our own worries, our deaf and blind cats will have joyous lives. 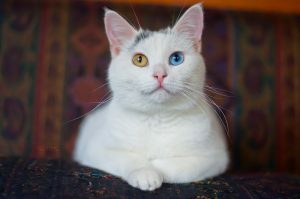 This article will discuss deafness and blindness in cats, how it occurs, how it is diagnosed, caring for your cats, and some tips for cat owners. She may not be able to hear, but that doesn’t stop her from being the perfect cat. Cats, like puppies, are born with their ear canals closed, but as they age, they gain the ability to hear. There are times when cats are born deaf and remain deaf. This is called hereditary deafness, when the inner structures of their ear degenerates. The gene for deafness is close to the gene for a white coat in cats and the gene for blue eyes, as well. In some cases, if a cat has blue eyes or different colored eyes (ex: one blue eye, one brown eye), they will probably be deaf or have hearing issues on the side their blue eye is on. 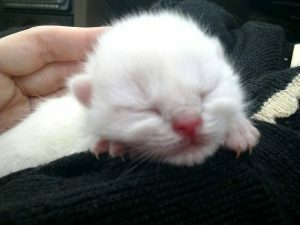 However, not all white colored kittens remain deaf as they age, but most deaf kittens that remain deaf are white. In terms of adult cats, in a lot of cases hearing loss or deafness occurs due to age-related issues. Adult cats usually go deaf due to nerve damage or other damage to the ear, but their hearing can also be affected by obstructions like infections, debris, or masses, and sometimes even some medications can affect your cat’s hearing. 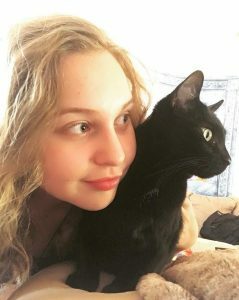 Some symptoms of deafness include: your cat not hearing your footsteps or voice when you are near, meowing very loudly, being unresponsive to everyday sounds (such as whistles or kissing sounds made to call your cat over), sleeping through loud and disturbing sounds, not coming to the sound of shaking food or treats. Although beautiful, cats like this have a much higher chance of being deaf. If you decide to take your cat to your veterinarian for a diagnosis, the vet may administer a procedure that’s called the Brainstem Auditory Evoked Response. Some of the steps taken involved in this test are: taking a piece of paper behind your cat’s head to see if your cat will or will not turn; putting you hand or a piece of cloth over your mouth and hiss since it is a universal communication for cats; tapping something that makes a hollow drumming sound to check your cat’s low frequency hearing, and crackling plastic or jingling your keys while your cat is sleeping or not looking at you to test their high frequency hearing. Unfortunately, deafness in cats is very progressive and irreversible. Hearing aids have been used for dogs, but your cat may not tolerate it and having hearing aids made for your cat may be expensive. It is very unlikely that your cat will tolerate wearing them. If you have a cat who is losing their hearing or if you have adopted a deaf cat, here are some tips that can help you and your cat adjust. Wave or shake your hands above your head to express your emotions to your cats. If you don’t like a behavior your cat is performing, you can make big gestures to communicate this to your cat. Come up with a few hand gestures to indicate simple phrases to your cat. Some owners use sign language to communicate “food” or “water” to your cat. Flicker your light switch(s) on and off to get your cat’s attention when you come home and enter the room they’re in. Their vision becomes even stronger part if they become deaf, so use this as a new way to communicate! Our cats create their own routines and like to stick to them daily. This becomes even more true when you cats losses one of their senses, so to avoid confusing your cat or stressing them, make sure you can keep up with a routine of feeding your cat at the same time as well as scooping our their cat box and playing with them as you normally would. This deaf little baby might need a little bit of extra help as he grows up. If your cat used to be an outdoor/indoor cat but is now deaf, keep them inside. It’s safer for them, especially since they will be scared, confused, and very withdrawn at first. Listening for predators or cars will be impossible for your deaf cat. Help them get used to being inside by keeping them comfortable and doing their favorite things with them. You can even consider training your cat to walk on a leash and harness so they can still get some outdoor exercise! Another important and vital sense for cats is their sight. Even though your cat’s vision is at its sharpest looking at an object that is two to three feet from their face, they can also see clearly in 1/6th the amount of light that humans need. They have a high rod to cone ratio that allows them to find the slightest movement, and unlike dogs, cats are not color blind. However, some cats are not born with the ability to see, or they lose their ability to see as they age. Kittens are born with their eyes closed because their optical systems are still developing. Their shut lids provide protection from bright light, pathogens, and debris or dirt. Not all kittens remain blind, but if they do, it’s more than likely due to the gene I mentioned earlier that’s related to the deaf gene and the gene for a white coat. 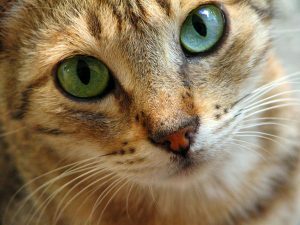 Any injury to your cat’s eyes can potentially cause permanent blindness. If your cat suffered a head injury, you need to take your cat to a veterinarian right away as severe head trauma can lead to blindness or other life-threatening conditions. Years ago, my cat Missues was scratched in the corner of her eye near the bridge of her nose by my dad’s cat. I was terrified because all I saw was blood. Thankfully, my mother cleaned up the blood and took Missues to the veterinarian right away; she didn’t suffer from any serious injuries, just a laceration of the inner lid which healed up in about a week. If this injury had been any more severe, Missues could have gone blind in that eye. Luckily, this is NOT how Missues turned out! You can never be too careful, though. Conjunctivitis is another illness that can cause blindness in cats. It’s the reddening and inflammation of the pink membrane that lines your cat’s eyelid. Herpesvirus (otherwise known as FHV-1) is the most common source of conjunctivitis. If your cat is diagnosed with conjunctivitis, you’ll need to take your cat to be seen by a veterinary ophthalmologist fairly regularly for treatment. Mycoplasma and Chlamydia can also cause conjunctivitis. Sometimes cats can be hit with “sudden blindness”, aka Feline Hypertension. This illness is often accompanied with hyperthyroidism, kidney disease, or diabetes. Cataracts can also cause blindness. 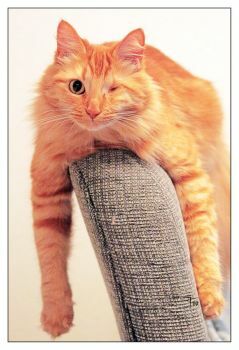 This is when the opacity of the lens is affected; occasionally surgery can remove the lens and restore your cat’s sight. Tumors such as as Iris Melanoma, eye lid tumors, or brain tumors may also cause blindness in your cat. In these cases, removal of your cat’s eye is protocol. 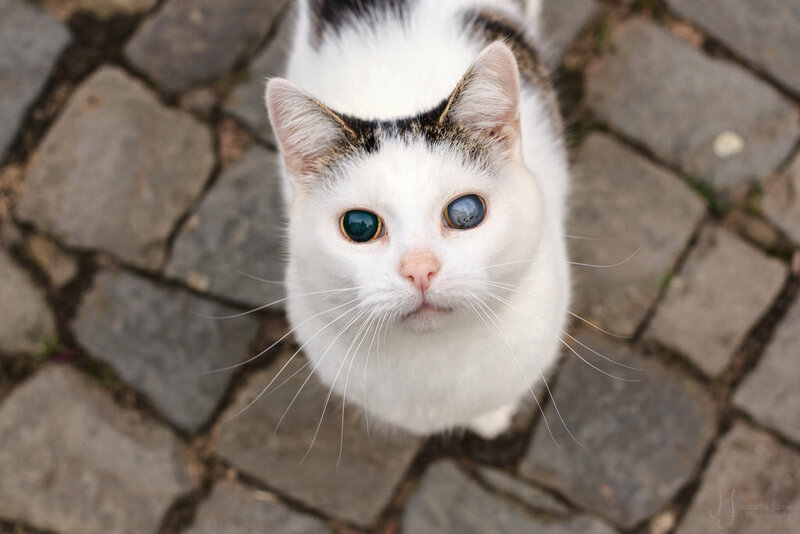 Glaucoma is one of the most prevalent causes of blindness in cats, and Progressive Retinal Atrophy is an inherited condition that cannot be stopped and results in total blindness. If you cat is slowly losing their sight, was born blind, or has recently lost their sight, here are some tips for you to help you cat with their disability and to keep them happy, safe, and healthy. Its very important to keep your cat’s litter boxes, water, and food bowls as well as their cat beds, cat scratchers, and toys in the same place so your cat can find them when they need them. Your cat will have a normal routine since they will memorize their home, but if you move your furniture, you will confuse and probably scare them. If you have to move furniture, do it gradually and introduce your cat to the new location of the furniture so they can re-form the map in their head. Your cat will be dependent on you, so they may follow you and want to be with you all the time. Start speaking to your cat like you would a person when you exit or enter a room so they will feel comfortable knowing where you are. Also speak to them to avoid scaring them before you touch them. Pad the sharp corners of your kitchen counters and bubble wrap corners of walls so you cat won’t get hurt by objects they can’t see. Cat’s respond to pheromones. You can purchase pheromones at your local pet stores that help relax cats and calm them down. You can spray their cat beds and cat trees so they know where to go, and what is safe. Using these methods, your deaf or blind cat can live a long, happy, fulfilling life just like any other cat. If you are thinking of adopting a cat, consider looking into adopting a deaf or blind cat. They may have a few extra requirements, but they deserve as much of a chance of a happy life as those who are unimpaired.